Lately I've been making homemade jam. I simply buy a bunch of fruit (much of which is one sale), cook it down on my stove top, let cool and freeze for later use. After realizing how much sugar is in everything from my Whole30, I decided to find a recipe that would allow the sweetness of the fruit to come out. 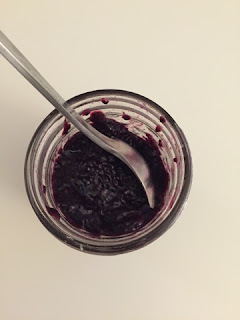 I started with this two-ingredient jam which worked great for strawberries, but found with juicier fruits like blackberries and blueberries, it was way too thin so I started adding chia to make it more of a jam consistency. It makes about a cup of jam (perfect for these jars) and freezes easily in plastic bags. I can't way to enjoy the flavors of summer for the next few months. Wash berries. Add berries, lemon and maple syrup to a pan over medium-low heat. Cook until berries breakdown, about 20-30 minutes. You want them to be a bit bubbly. Stir occasionally. Take off heat and stir in chia seeds. Let cool. Place in a plastic bags and freeze or into a jar for the fridge. It will keep for 2 weeks.